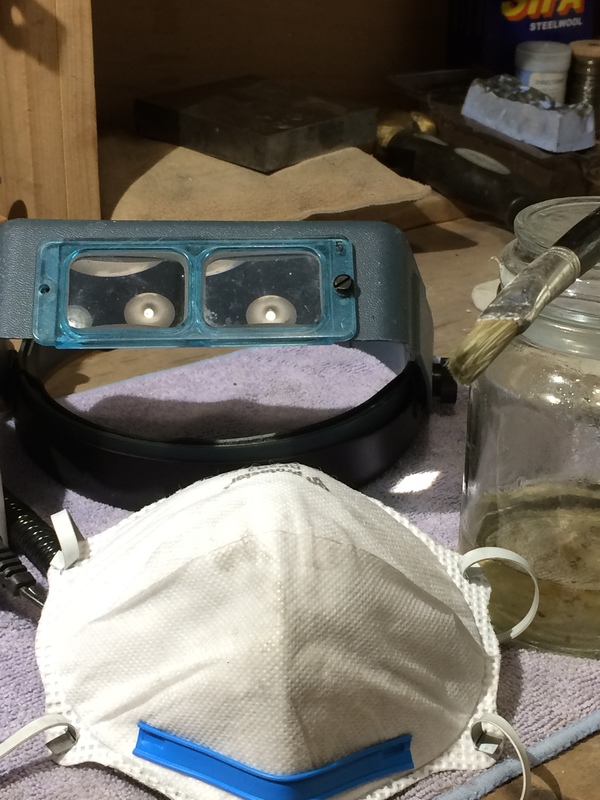 I do have safety procedures when I work at my bench, but sometimes I get a bit careless. As I found out the other day and ended up with a dreadlock in my hair and nearly scalped.Each day before I start making my jewellery I check my gas cylinder with a bit of soapy water and a painting brush to check their are no leaks. Then tie back my hair in a pony tail and put my apron on, face mask, glasses and loop. Well, I thought these were good safety procedure sand everything was covered, or so I thought until the other day. I did all of this and started working. Everything was going well until I started polishing. Oh, one thing I need to explain before I continue is I am blind in the right eye so if anything is hanging down on the right side of my face I don’t notice it. Well, to continue my story. When I was polishing my jewellery with my hand tool my hair had fallen out over my loop and was hanging down the right side of my face. Once I lent over closer to the tool to see better my hair wrapped around the tool and, ouch! That hurt so much!! This is a picture of the tool I caught my hair in. I pulled all the hair off of the tool to free it up and then felt my head to make sure there wasn’t any blood. Everything seemed ok, but when I went to clean the piece of jewellery I was working on at the sink I glanced up at the mirror above the sink and saw the dreadlock in my hair. That was when I realised how lucky I was, I could have scalped myself. No wonder it hurt so much. So I am adding to my safety procedure a hair net. That way my hair will stay away from any tools. It really made me realise how important these safety procedures are.